If you're anything like me, you have to have a game plan when it comes to feeding the family. For a lot of us, though, just thinking about all the meals that have to be prepared can be overwhelming. 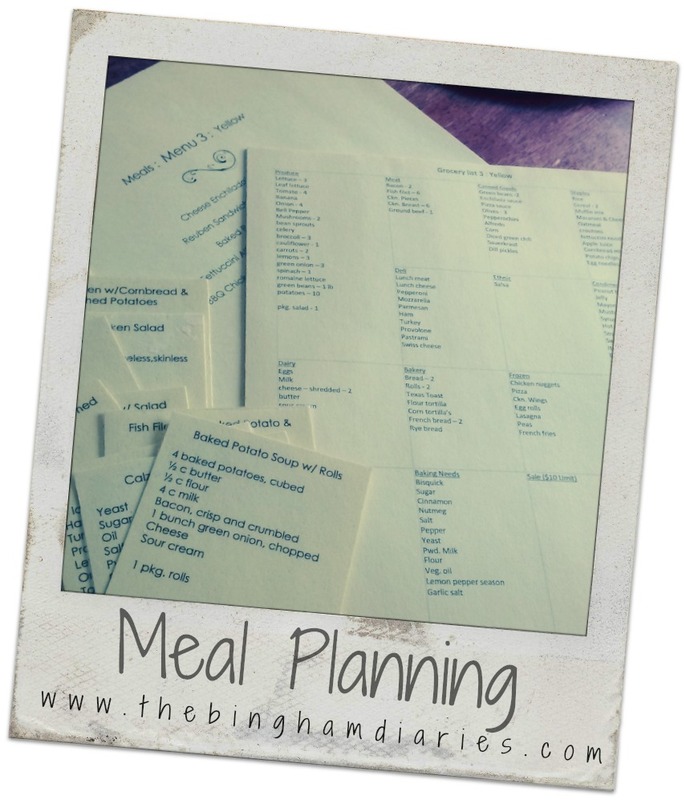 Following a meal plan streamlines the whole dinner process. I never have to ask myself what to make, because I KNOW what I'm making. I've also found that it's a pretty easy process to follow, because I am rarely "in the mood" for a specific dish. Since all these next bits go together, I'm going to just dive right in and explain as I go. I have seven library card pockets attached to a cork board. On the bottom right, I have all the dinners listed on a 5x7 laminated sheet. Yes, it is redundant, but I do this so that I can see, at a glance, what dinners I have all the ingredients for. On the front of the pocket, I have that day's breakfast and lunch listed (Breakfast and lunch don't change. They are the same week to week!). Inside each pocket is a 3x5 dinner card. 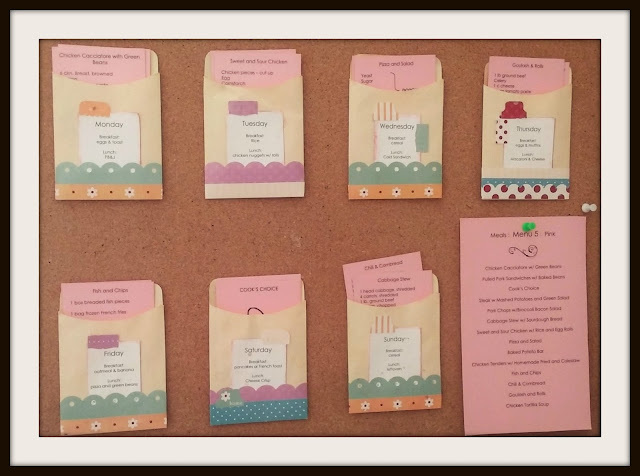 As you can see, each dinner card has the ingredients listed. This is SUPER, MEGA IMPORTANT, because it lets the other members of the household help in the dinner prep. I can't tell you how many times I've been running late, and have needed someone else to get dinner going. It's really easy to pull out the card, and get started on dinner prep. Also, the cards are laminated, so it's no big deal if something spills on it. 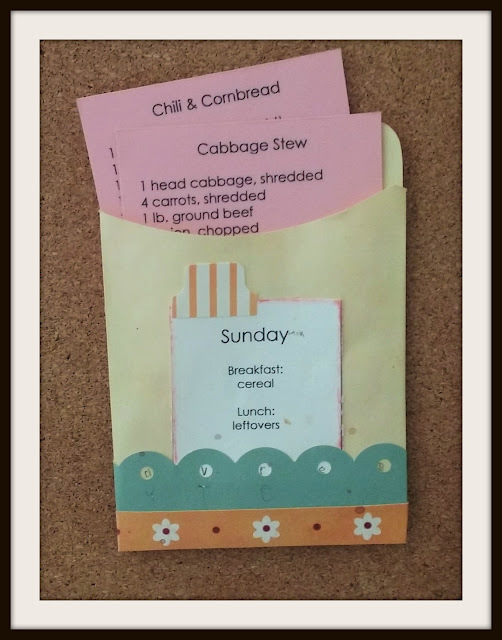 Another reason I like to list the ingredients on the card is because it is super helpful when you are putting together your grocery shopping list. It's even important to add the condiments you use, because if you're having burgers and french fries, I'm pretty sure you'll want ketchup. You might even need to add Worcestershire sauce to that card, because you use it to season your hamburger patties. You have to be very thoughtful about ALL the different items it takes to make that particular dinner. You'll also notice that I have the breakfast and lunch options listed on the front of the card. Currently, I only have one option listed for each meal, for each day of the week. This will be getting an upgrade soon, because we started bringing our own lunches to school. ($4.50 per kid, per day.... No thank you.) What I've been doing is a week 1/week 2 option, and I've adjusted my shopping list accordingly. Speaking of shopping lists, let's take a closer look at mine. I have my shopping list divided into sections: produce, meat, canned goods, staples, deli, ethnic, condiments, dairy, bakery, frozen, miscellaneous, non-food, baking needs, and sale. Having it divided saves me time, saves me money, and lets me send helpers around the store to gather things. My basic grocery list is limited to breakfast and lunch menu items. I don't have any dinner items included, so that I can have a starting point for the next part.... which is deciding what meals work together in a given week, and what meals don't. For example, if I'm going to have roast chicken for dinner one night, I will also choose a dinner that utilizes the leftovers from that meal, meaning that we will have a chicken noodle soup on that same meal plan. Another great example is chili. Chili is a hearty dish on it's own. Leftover chili makes an awesome topping for baked potatoes. Extra chopped veggies go great in omelets and stir-fry dishes. SO. I have breakfast and lunch figured out. And I have all these dinners that my family likes to eat. The next step is MORE ORGANIZING. I have my meal plans set for two weeks at a time. This means I am shopping for 14 days of food for my family at a time. However, it only includes 13 dinners. In every meal plan, I have a "Cook's Choice" card. This is your get out of jail free card. Cook's Choice night might mean Taco Bell. It might mean leftovers. It might mean you're trying out a new recipe. The point is, it's YOUR CHOICE. If you want to do one week at a time, then pick 6 dinners that work well together (or 7 if you're so inclined). Then, you will add the ingredients for that dinner to your grocery list. Be sure to include ALL the items you need to make that dinner. Then, as you are adding to your list, use tally marks to add up the amount of a particular item. You don't want to write "potatoes" on the list, then not have enough for everyone. Or you get too much, which is just as bad! After you have all your meals figured out, then it's just putting everything together to work for you. Check over your lists, and you dinner cards. Then you just print it up and you're *almost* ready to hit the store! 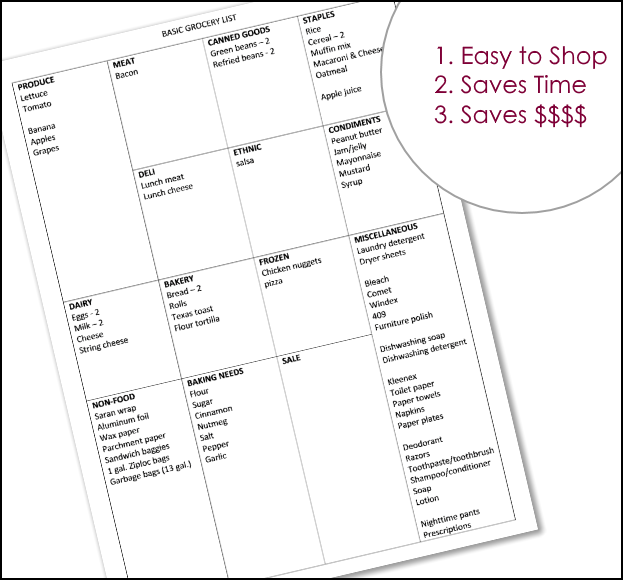 Once you have the meals planned, and your grocery list in hand, SHOP YOUR HOUSE. Open the fridge and pantry, cross off items you already have enough of. If you have 8 boxes of spaghetti noodles, you probably don't need to buy it on this trip. (Unless of course, there is a killer sale on boxed pasta.) Shopping your house is key to saving money at the store. Plus, it keeps you on top of what's running low, or needs to be eaten fast. It's also great, because your list might say you need 5 cans of cream of chicken, and you have 3 on hand. Just cross out the five, and put a 2. You're not over buying anything, and you'll start to shop more efficiently. Another bonus to this menu system is that you will begin to see what items you use regularly. I have a "best price" list that I keep, so I can know if an item is really a good deal or not. Tomato sauce on sale for $0.59 is not a great price, but $0.29 a can means I'm getting 10. I feel like this is a lot of info to digest. Do you have any other questions or need any clarifications? Otherwise, get on it!